A Nurse and A Book: The Readers of Broken Wheel Recommend by Katarina Bivald - Win a copy!! 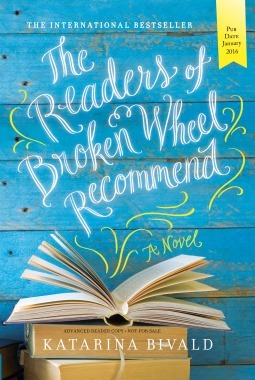 The Readers of Broken Wheel Recommend by Katarina Bivald - Win a copy!! Broken Wheel, Iowa, has never seen anyone like Sara, who traveled all the way from Sweden just to meet her pen pal, Amy. When she arrives, however, she finds that Amy's funeral has just ended. Luckily, the townspeople are happy to look after their bewildered tourist—even if they don't understand her peculiar need for books. Marooned in a farm town that's almost beyond repair, Sara starts a bookstore in honor of her friend's memory. All she wants is to share the books she loves with the citizens of Broken Wheel and to convince them that reading is one of the great joys of life. But she makes some unconventional choices that could force a lot of secrets into the open and change things for everyone in town. Reminiscent of The Guernsey Literary and Potato Peel Pie Society, this is a warm, witty book about friendship, stories, and love. What I Say....This was such a fun, cute read. Sara is a bookworm from Sweden who has decided to come to America to meet her pen pal, Amy. Out of the entire United States, this adventure leads her to a tiny, run down town in rural Iowa. And her pen pal is dead. Welcome to America! Sara decides to go ahead and stay for her visit, and the townspeople do their best to make her feel welcome, including having her stay in Amy's house - staying in a strange country, in a dead woman's house? Sounds like VRBO gone bad. Sara decides to open a bookstore with Amy's large collection of books from home. Not really sure what kind of bookstore it was, but she seemed to have every book that could be sold. Although, I don't recall her ever selling one - which is fine, because it seemed kind of weird to sell a dead woman's belongings. But anyway, Sara gets to know all of the townspeople, and they are an odd bunch. But she meets Tom, the requisite hot single guy in Broken Wheel, along with the crusty diner owner, the churchgoing lady, the gay bar owners, the bisexual young man who migrates to Broken Wheel (why is anyone's guess), along with a host of other misfits. One thing that I didn't like was that there were too many characters with not enough storylines, so at times, I couldn't remember who they were or why I should care. I also didn't buy Caroline's storyline. It was way too sharp of a turn for that character - it was not even remotely believable. But overall, it was a great little weekend book. And now is your chance to win a copy for yourself! !